Coming up for air, it's time for GBU. It hasn't been a perfect season for Monster Energy Pro Circuit Kawasaki, as they've had many ups and downs through the first five rounds of the season. But the team of Adam Cianciarulo and Garrett Marchbanks conquered the mud on Saturday and walked away with 1-2 finishes. This marks Garrett's first podium of his career, and hopefully this new wave of momentum will carry on through the break and into the second half of the season. He has shown that he has potential all season long, but his Main Event finishes leading up to San Diego had been a little underwhelming. Now that he has a podium under his belt, though, maybe he'll string together some solid finishes. 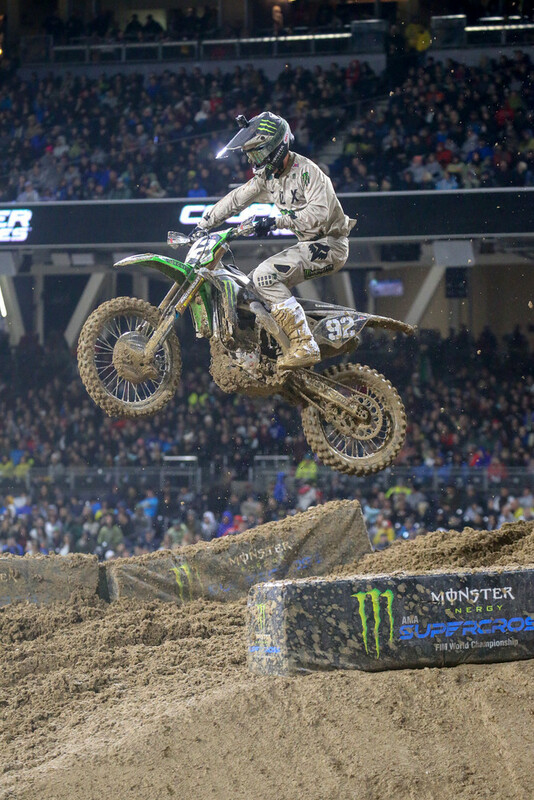 As for Adam Cianciarulo, this was a huge win. He now has three wins in five rounds, and possession of the red plate heading into the break. Can you believe that this is the first time Adam will hold the red plate since he was a rookie, aka when he was practically a kid? Wild stuff. Anyway, it looks like Adam has really started to figure out how to apply the things that he was working on all off season (being more calculated, making less mental mistakes) to race day. Are we about to see Adam gap the rest of the field in points over the next few rounds and ride into the sunset with this thing? I could see it happening. The Canadian continues to impress. Every week Jess looks more comfortable racing up towards the front with the factory guys, and I still can't believe how solid he has been this season. This isn't even his main series! After the performances he has had here in the U.S., I expect for him to absolutely destroy his competition up in Canada when the Triple Crown series gets underway. Things just haven't been working out for Dylan this season. He has been up on the podium several times and he's still in the title fight, but he hasn't gotten a win despite having the speed and he's had two bad races that have hurt him pretty badly in the points. I can imagine that San Diego was an extremely frustrating experience for Dylan, since he was in position to secure another podium until his bike quit on him with only one lap left. Taking a seventh place finish at this point in the championship isn't ideal, especially since he had been working to claw back points after finishing sixth in Glendale. If anything, though, you'd think that this would light a fire under him as we head into the break and that he'll come out on the other side ready to put his stamp on the season. But we'll just have to wait and see. Things have been getting progressively worse for Colt as the season has progressed. Slipping back positions on the podium wasn't a huge concern since he was still on the podium. Sure, he was bleeding points, but he had a small cushion to lean on and things weren't looking too dire. There was the expectation that he'd get a win or somehow extend his lead again before he lost it, but then San Diego happened. 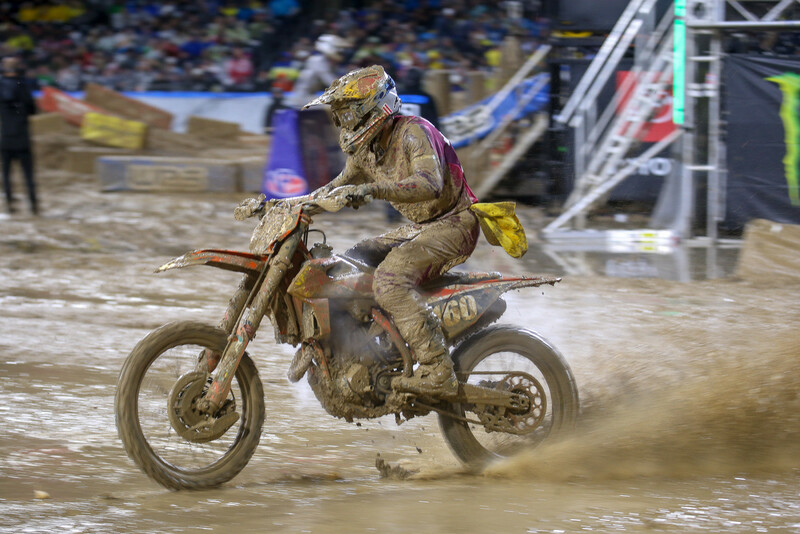 It was a mud race, and anything can happen in a mud race regardless of how consistent each rider normally is. And, well, Colt had a terrible Main Event. That's really all there is to it. He went down early and then ended up going down a few more times before the race was over. And who knows, maybe Colt will actually look at this as a positive. He may be down ten points after leading for the first four rounds, but this is the first time he's been able to chase instead of defend. It's a different mindset, and maybe that'll reignite the Colt Nichols we saw at Anaheim 1. Eli went onto The Whiskey Throttle Show earlier in the week and talked with David Pingree and the guys for quite a while. He hit on a lot of subjects that he has generally avoided, and it really gave a glimpse at what he's like on any day that's not race day. I'd recommend giving the episode a listen if you have a couple of hours. But anyway, the point is that he mentioned on the show that he did take a few weeks off around Christmas because he tweaked his back, and that he was finally ready to start fighting for wins. And look at that! Just a few days later he gets his first win of the season and takes over the points lead. It wasn't a flawless win, though, as he had to stop at one point after hitting one of the Tuf-Blox, and then again after he got roosted by a lapped rider and was struggling to get clear vision through his goggles. But in the grand scheme of things those were small hiccups in what were very challenging conditions. If he wins again in Minneapolis, the competition may start to sweat a little bit. Regardless of what the conditions were, this finish was exactly what Justin Bogle needed. He didn't have much time on the KTM before the season started, but even with that in mind the first part of this season hadn't been great for him. But this top-five finish may provide him with a nice confidence boost that propels him into securing top-ten finishes consistently, which is a must for him this season. This is a fill-in ride, after all, and you could almost look at this season as an open audition for him. He needs to impress or else he may end up back on the privateer/support team route. 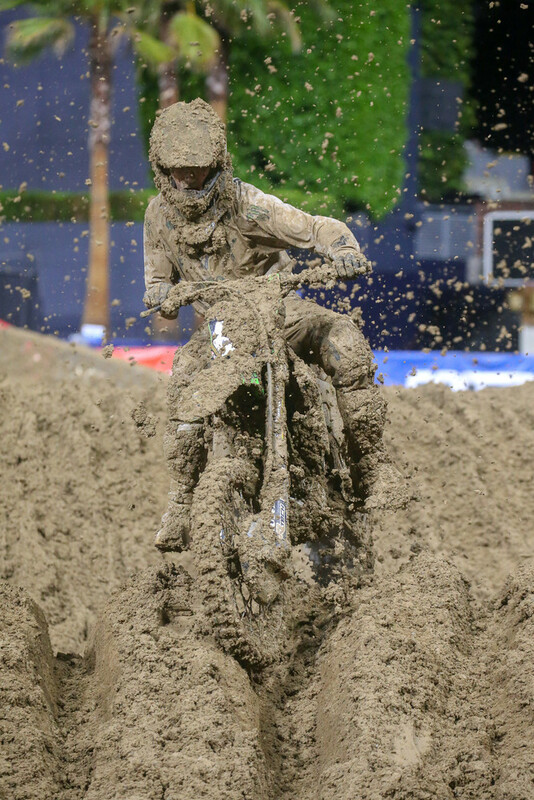 Similar to Colt Nichols, San Diego was just a bad night in the mud for Cooper Webb. He didn't look out of sorts or as if the red plate was weighing down on him; he just got a bad start and then crashed when he tried to avoid running into the back of his teammate. That was all there was to it, really, and just like that he has lost the red plate and now sits fourth in the championship. There is no glaring problem that need to be addressed. This is just going to be a matter of bouncing back and not letting this snowball into more mediocre results. Minneapolis is going to be a big race for Cooper. Justin Hill's first year of racing a 450 full-time has been a certified train wreck. I don't know if there's any other way to describe it. 15-13-11-14 were his finishes heading into San Diego, and then he had a crash during practice and had to take a trip to the hospital. Now, I sincerely hope that the injury is minor and that he'll be back racing soon, but I will say that I also sincerely hope that whenever he does return we start to see flashes of the Justin Hill that showed up to a couple of 450 races in 2018. Where'd he go? What's he doing these days? It'd be nice to see him again. 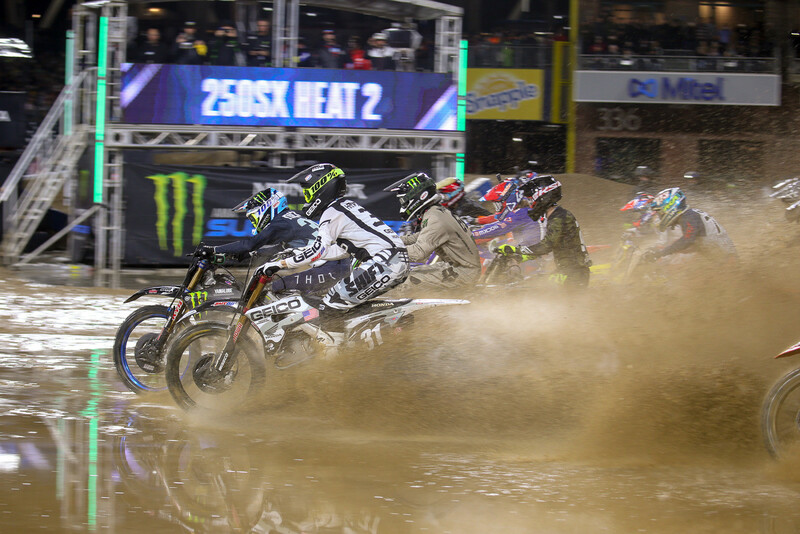 The racing in San Diego was better than expected considering how bad the conditions were. It was nasty out there, and I'm to be honest, I'm surprised that there wasn't more carnage. Only two big names (Dylan Ferrandis and Justin Barcia) had bike problems that ended their races. Everyone else made it out fairly unscathed as far as bike problems go. Fortunately, the East swing of the series has plenty of domes, so weather won't be much of a threat over the next several weeks. Side note, there have been quite a frenzy of posts from tons of riders who raced San Diego about rashes, burns, and equipment problems that they're now dealing with because of the lime drying agent that was used in the dirt. We're not talking one or two riders, either. It seems like most of the field is at least dealing with body rashes. I've never seen anything like this before, and while I'm not exactly sure who's at fault in this situation, this has to be addressed by Feld Entertainment in some capacity. Expect a statement from them on Tuesday. Guys are having to skip training sessions this week to treat their skin, and teams are scrambling to try and salvage equipment that was severely damaged by the lime. That's it for me. Who were your picks for the Good, Bad, and Ugly from San Diego? For a sport that has as much privateer engagement this race was a significant setback. I feel for the guys who actually have to spend their money on parts, bikes not to mention the rashes and health issues that this caused. It's a bad look and one the AMA needs to weigh in on. Bam Bam having a mechanical while in podium contention. That sucked. Nicely put on a touchy subject.